“Many toilet bowl cleaners contain less than 10 percent hydrochloric acid, according to the U.S. Department of Health and Human Services. Some products, however, contain upwards of 50 percent hydrochloric acid. Therefore, while store-bought cleaners are full of other chemicals and toxins as well, and can lead to numerous adverse effects on health, all-natural bowl cleaners are toxin-free, effective, and all-natural. What’s more, you can forget about scrubbing! Baking soda is a powerful natural cleaning agent, that fights bad odors, while hydrogen peroxide cleans the stains and prevents and eliminates mold on the bathroom. In a large mixing bowl, mix baking soda and the cream of tartar. Gradually add hydrogen peroxide, stir, and add the essential oil. Next, pour the mixture into silicone ice cube molds, about 1½ inches in width, press firmly, and place them in a dry, cool place for 4-6 hours. When set, pop fizzies out of molds, and store them in a glass jar. 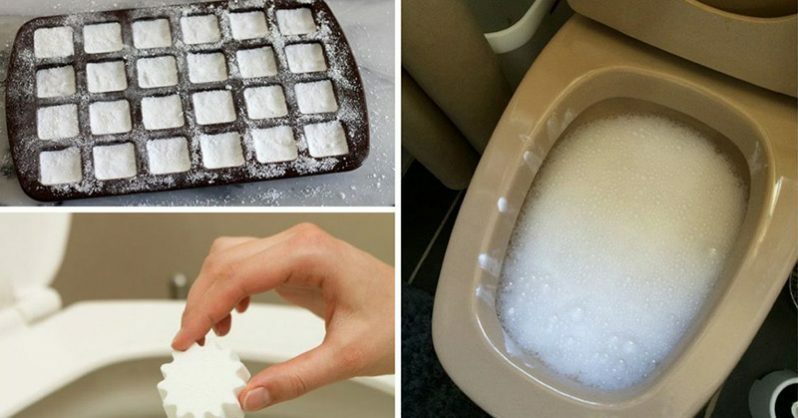 Next time you need to clean the toilet, just throw one of these toilet bombs inside the bowl, leave it to dissolve for about 10 minutes, and then flush. Repeat twice a week.